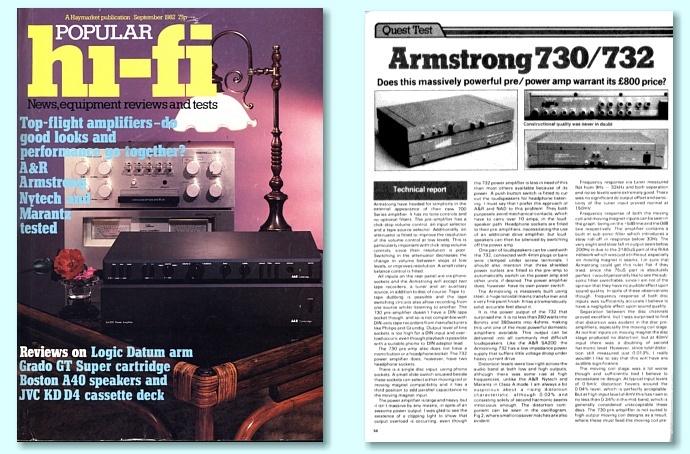 The only reviews I’m aware of that examined the Armstrong 730/732 combination appeared in the July 1982 issue of Hi Fi News and the September 1982 issue of Popular Hi Fi. Alas, their contents raised a number of what people today might call ‘issues’ of a kind you will have seen before if you have read the earlier pages in this set of recollections and reviews. As before, I will use these reviews as a basis for “reviewing the reviews”. In many ways they are now a lesson from history of how reviews may not help some readers to come to a well informed decision. To help clarify this I have included some ‘asides’ to deal with the underpinning technical issues. I have put these into boxed-out sections which can be skipped if you aren’t interested in the details. It was then, and is now, a common article of faith amongst some who carry out ‘subjective’ reviews for magazines that a ‘double blind’ test may‘obscure’ their ability to hear the differences they report. Hence the reader is, indeed, presented with deciding if they are willing “...to rely on the reviewer’s judgement and experience”. However there are plausible alternative explanations for an inability to hear differences during a double-blind comparison. e.g. That any ‘difference’ is actually in the range between trivially small or non-existent. Or may simply be due to some other factor – i.e. not due to the cause(s) the reviewer suggests or asserts. If this possibility cannot be excluded then it may be wise to treat their comments with scepticism to avoid being misled. That someone with “judgement and experience” genuinely believes something doesn’t actually guarantee their belief is correct. “Blind” comparisons require that the person(s) involved in trying to judge on any ‘sound’ characteristics of items being heard should not have been told – or can see – which actual unit is being auditioned at any moment. The aim is that they only have the sounds they hear as a basis for any judgements. Their judgement can’t then be affected by any expectation regarding what they ‘will hear’. This leads to the term “blind A/B comparisons” where two items are only identified to the listener(s) as ‘A’ and ‘B’. The tests are designed to avoid the listeners having any other info – other than what they hear – to give them an clue which actual amplifier, etc, they are listening to as ‘A’ or ‘B’. The term “Double blind” means that no-one else knows or can see because the test is arranged to prevent anyone else unintentionally giving any kind of hint or sign to the person(s) listening. The basic problem with these tests from the reviewer’s POV are simple. Such tests take time to set up and carry out. They often require repeated comparisons to see if any ‘differences’ show up consistently. Care must be taken to ensure the sound levels should be as similar as possible to avoid the change in level affecting what is preferred or perceived to be ‘different’. Care must be taken that the choice of ancillary equipment (e.g. 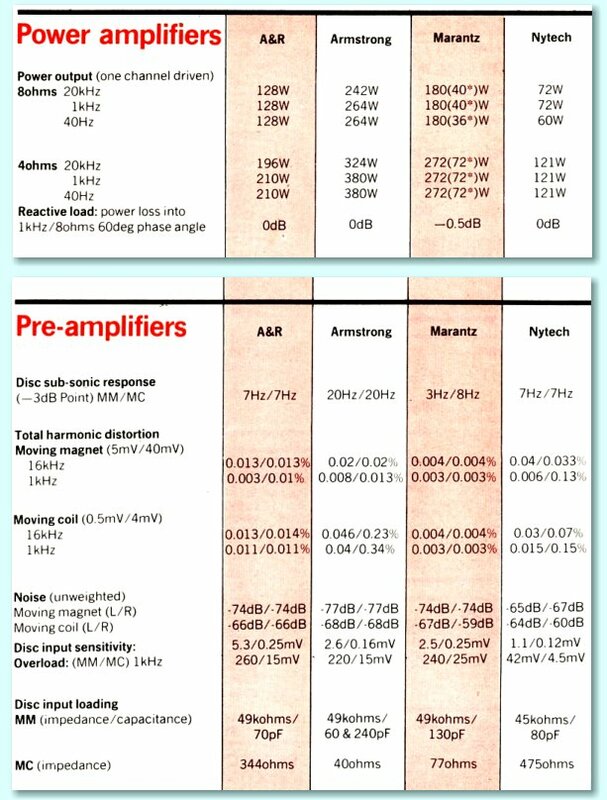 the speakers used when amplifiers are being compared) aren’t ones which may affect or bias the results for some reason without this being known and stated. A final snag is that : Quite often when such tests are done with care the listeners find they can’t reliably distinguish one item from another. Regarding the last point, many reviewers simply claim that such tests have an almost diabolical magical ability to ‘obscure’ differences they are convinced they can hear when they can also see – or have other ways to distinguish – one item from another. They also, quite reasonably, say such tests take a lot of time and effort. Since they are convinced they can hear differences anyway, they therefore tend to dispense with doing a blind ‘AB’ test entirely. However there are good reasons to suspect that this means their ‘subjective’ impressions may be unreliable in many cases. Human hearing and what we perceive varies with time and exposure. Even a slight movement of the head can make a small but perceptible difference. As can a tiny change to the volume level. Often something like playing the music slightly louder is perceived as some other kind of change in the quality of the sound. Some carefully controlled ‘AB’ blind comparisons have been done on large collections of audio enthusiasts. These involved having two different systems to ‘compare’ and playing the same item of music twice. In some cases the music was played on one system, then the other (‘AB’ or ‘BA’). But in other cases the music was played on the same system twice (‘AA’ or ‘BB’). In each case the audience was not told what had been done and was asked simply to say if the two examples sounded the same, or sounded different. The results showed a clear tendency for people to say that when the same music had been played twice on exactly the same system in the same way that the two examples were ‘different’. To them it will genuinely have sounded different. But not for reasons stemming from the hi fi equipment! This outcome didn’t surprise professional audio engineers or academics studying perception. Listening to music physically alters the hearing, so the same thing will tend to sound ‘different’ because the physical response changes. People hearing the same thing also recognise some aspects and detect others they missed the first time around. They may also turn their head slightly, or make some other change. Human hearing also varies over long timescales. The more intensely someone tries to listen for details and try to detect signs of changes, the more exposed they may become to these effects. All this is in addition to the possible psychological urge someone may feel to show they can hear a slight difference when one might have existed, or to find reasons to prefer something they expected to like more before they start. The urge to ‘hear a difference’ may be particularly strong amongst reviewers who may feel their income and reputation depends on a demonstrated ability to use “golden ears” to hear details others might not notice. A double-blind test that uses randomised choices tends to suppress these problems because they tend to average away. So the cautious view of many professional audio engineers who don’t write hi-fi magazine reviews is that it makes more sense to suspect that reports of perceived ‘differences’ which become ‘obscured’ when the test is double-blind may simply not be worth relying upon. It is, of course, correct to argue that carefully performed double-blind tests designed to deal with these human failings can be expensive, time consuming, and tedious for the participants. But my own personal view is that it makes sense to be doubtful of ‘subjective’ comments in the absence of evidence that they have any reliability. Even if there are differences, we are also free to wonder if we or someone else would reach different views as to the ‘sound’. As, indeed, can often occur when different reviewers make ‘subjective’ comments before they have had a chance to learn what comments other reviewers have made. Note that none of the above assumes or implies any reviewer is deliberately deciding to ‘make up’ what they say. The problem here is that – in all good faith and with the best of intentions – people may state their honestly held beliefs, but still be mistaken. Without a suitable controlled test we may not be able to tell if what was written is correct, or arose for the reasons stated. In fact I had spent a lot of time investigating various types and makes of capacitor, and had concluded that the ones I have selected were well suited to the task. The amps performed well, and no-one who had listened to the amplifiers showed any awareness of them being affected by this in terms of sound quality when they hadn’t been told what kind of capacitors it employed. This issue will arise again later on in a way that seems to indicate that – despite the “speculation” and feeling it was “unwise” – the evidence implies that reviewer probably couldn’t actually hear any deleterious effects due to the capacitors, either! Alas, since these comments weren’t based on any kind of controlled trial it is impossible to know if they mean anything or not. Anyone else might have decided they heard something quite different. And such impressions might have altered if almost any external variable had been changed – loudspeakers, different listening room, change of volume level, etc. The only specific comments is about what happened when the power amplifier clipped. But of course, the whole point of making an amplifier as powerful as > 200 Watts per channel and providing a clipping indictor is to ensure that there is no need to have the amplifier clip in normal use! In addition I can’t help wondering how well the speakers were faring when the 732 clipped because the powers it would be delivering would have been very high. The peak powers available were well above a mere 200 Watts! Which we are left interpret for ourselves. For obvious reasons, this was likely to make readers conclude that the amplifier had failed or broken down during this test, and would presumably need to be repaired! In fact, nothing of the kind had happened. But it seems plausible that this one sentence in the review would have caused many potential buyers of the 700 amplifiers to take it off their mental shopping list! The parallel combination of 8 Ohms and 2·2 microfarads was a common test load to probe the ability of an amplifier to drive loads like electrostatic speakers which were essentially capacitances at high frequency. In particular, using a square-wave into such loads would demand large peak currents to be drawn from the output transistors when they also had a large voltage across them. So pushing them as close as possible to being overloaded, and to fail. When we read this we had no idea what had happened. The first I saw of it was in the published magazine. I had worked on the power amplifier for many years, and had tested it into this “cruel load” countless times without any such problems. But we did not get the amplifier back until some weeks later. When we did I quickly checked it and found that a power line fuse had blown. One of the design features of the 700 power amp was that it did not employ any active current limiting circuits as these might cause current limiting during normal use. Instead it relied on highly durable transistors and power line fuses. The reviewer was aware of this and mentioned the fuses in his review. But made no mention in the review that he had blown them. Nor did it seem to occur to him to check them, replace the one that had failed, and continue. This is particularly puzzling given that in another review of a different amplifier, published by Hi Fi News a month later. There it was duly reported that a fuse had blown during challenging tests, was replaced, and all was well. I can’t be certain because I was not present when the reviewer did his measurements, and wasn’t able to talk to him afterwards. My impression is that he simply took for granted that the unit had blown a transistor or two and that was the end of the story. OTOH If he had checked and replaced the fuses, the question becomes: Why on Earth did he talk of the amplifier’s “demise” without saying this? It surely should have been obvious to him what many readers would probably conclude when they read his statement! The magazine editor might also have realised this, but I have no idea if he had known what had really happened. So perhaps the editor took for granted that the amplifier had, indeed, blown up! As with the example of Hugh Ford’s 621 review in Hi Fi Choice, this episode starkly shows the serious problems that can arise when reviewers (or editors) fail to check and fully clarify ‘odd’ results with makers or designers before publication. Such episodes can do avoidable and unnecessary harm to manufacturers and seriously mislead readers. The above encapsulates another questionable point in this review. The measured results presented here were different to values I would expect for the moving-coil (mc) input. I had measured the amplifier before (and after) it was sent for review. The overload levels I’d determined disagreed with the above. Unfortunately, the background needed to even assess the above assertions regarding overload point isn’t discussed in the review, but they do matter. Without this background the contention that the overload point isn’t sufficient is contentious. For those who don’t wish to investigate the technical background I can summarise the situation in a series of points. The measured results for the mc look very much like an example of the reviewer employing a method which affects the results obtained in some way. Unfortunately, unlike the Hugh Ford review of a 621 amplifier I was never able to discuss this directly with the reviewer and find out the details of how he obtained his measurements. So I can’t be certain why his results differ from mine (and from those obtained by others). The way this review presents measured results tends to hop between quoting values in mV and dB relative to a reference level. This may well confuse readers who may not realise when the values include (or not) the scaling due to RIAA correction with frequency, or know how to take this into account. It is open to question what overload level is sufficient, and exactly how this is to be defined. This depends on a number of factors which aren’t properly discussed in the review. In particular, it depends on the choice of cartridge, the modulation levels actually recorded onto real-world LPs of music, the limited ability of cartridges to track these, and their relative levels of distortion even when they manage to track real musical peaks. Before going into more technical detail, for those who are interested one more fairly basic point can be made. The approach I had in mind at the time was that if anyone felt their mc cartridge produced too high an output for the mc ‘head amp’ in the preamp then it would be a simple matter to use the moving magnet input instead. (If preferred, with loading resistors added.) The mc head amp was provided precisely because most mc cartridges produced tiny output voltages. So it was designed to work well for the bulk of good-quality mc cartridges when playing real-world LPs rather than sitting on a test bench being fed very high level test tones! The case of the magical moving coils. In general terms, the cartridges used to recover electronic signals from an LP can be divided into two types – moving magnet and moving coil. Back around 1980 the moving magnet types had an established long history of being well regarded and often used. But moving coil types were rapidly becoming more popular, and were fashionable amongst reviewers. In general, the moving coil cartridges output much lower voltages than moving magnet examples when playing the same LP. So their signals needed extra amplification. Because of this historical context the Armstrong Series 700 pre-amplifier adopted the approach of including a moving coil ‘head amp’ to accompany an ‘RIAA’ amplifier stage. The user could then select if the input for disc replay went direct to the RIAA amplifier, or via the ‘head amp’. Nominally, the head amp was used to boost the output from moving coil cartridges up to the voltage levels more typical of moving magnet types. So the result could then be handled OK by the RIAA stage. Hence the switch was labelled giving a choice between the two types. The above illustrates this division of purpose as implemented in the 730 pre-amplifier. When the input is switched for ‘moving magnet’ input the signals bypass the head amplifier. When the input is set to ‘moving coil’ signals go though the head amp and this boosts their size for presentation to the RIAA stage. In practice the sensitivity (voltage out for a given amount of modulation of the LP groove) of both types varies from one example to another. So the first factor we need to take into account is, what range of sensitivities would be typical for each type? For the sake of a relevant example I’ve chosen some cartridges which the same reviewer examined an issue of Hi Fi News (September 1982) that appeared just two months later. From this alone we can assume he should have known what kinds of signal levels would be typically produced by them in use. All the examples here are moving coil designs except for the Shure V15/V which is moving magnet. The listing in the review also included an indication of the amplification the manufacturers expected to be required to use their cartridge. i.e. It distinguished the examples that would require a head amplifier (HA), from those which the makers intended for use directly into an RIAA amp input designed nominally for moving magnet cartridges. We can see that all but one of the moving coil examples which their makers/reviewer expected to require a moving coil ‘head amp’ voltage boost and impedance matching all have a sensitivity such that the standard LP 0dB reference level would output around 0·2 mV. The Mission 773HC will output ten times the voltage, but it was aimed at being used directly with an amplifier input designed for moving magnet cartridges. Just one example (Koetsu Black) gives 0·45 mV and is expected to be use with a head amp. From this we can draw the general conclusions that typical moving coil designs output from about 0·2 mV to 0·5 mV for 0dB reference level modulation and will require an input designed to accept such outputs. Some moving coil designs were produced to deliver much higher output levels. These also tend to have higher source impedances. Hence the highest level examples are likely to be best used with an amplifier’s ‘moving magnet’ input, and, indeed, may well be designed for that! So in practice it made sense around 1980 to assume that moving coil cartridges which required a dedicated input would deliver 0·2 to 0·5 mV when playing LP modulation at the 0dB RIAA reference level. Having settled on a sensitivity around 0·2 - 0·5 mV for a moving coil input we can now consider two questions: How high a modulation level can we expect a cartridge to play without gross mistracking? How large are the modulation levels on real-world LPs as distinct from laboratory test discs? Answering these questions will determine what kind of maximum signals levels a moving coil amplifier will need to handle well in practice. Of course, a signal generator used on a test bench can easily produce much bigger signals. But the amplifier is meant for use in the home, not on a test bench. These questions are ones that I and others have investigated in the past, so I can provide some links to results that may be useful as a basis here. A webpage at http://www.audiomisc.co.uk/HFN/LP1/KeepInContact.html shows the results of some simple analysis of the physics that tends to limit the maximum modulation we can expect a cartridge to be able to read from an LP without serious mistracking. From this simple analysis we can see that unless a cartridge stylus assembly has an exceptionally ultra-low effective tip mass it will be unable to play a high frequency tone at levels around 0dB RIAA (equivalent to 45 cm/sec at 20 kHz). The page at http://www.audiomisc.co.uk/HFN/LP2/OnTheRecord.html shows the results of carrying out measurements to determine what was recorded, and could be replayed, from a variety of LPs. These results were obtained using a Shure V15/III. In good condition these are likely to have an outstandingly low effective tip mass, and higher compliance than the moving coil cartridges of the period around 1980. The page at http://www.audiomisc.co.uk/HFN/LP3/aroundthebend.html provides more information on this, including some from Shure. In past decades Shure often printed graphs, etc, showing the highest peak levels they could find on any LPs and the levels their V15 series could track. They all indicated that it was unlikely that any real cartridges in normal use could actually track levels as high as 0dB at 20 kHz. In practice moving coil designs tend to have a somewhat higher tip mass than a V15, so would be rather more limited at HF than the Shure designs! Taking the above results overall we can draw three general conclusions. Firstly, that in reality it will be rare for real-world commercial LPs to contain high modulation levels of the kind the review implicitly assumed. In particular the peak levels at high frequencies are likely to be somewhat below 0dB RIAA. i.e. well below 45 cm/sec. And if the LP does contain higher levels it is questionable if most/many/all (choose the term you prefer) moving coil cartridges from around 1980 (or now!) would play them without gross mistracking problems. If we combine this with a moving coil cartridge which give 0·2 - 0·5 mV from a 0dB RIAA 1 kHz reference tone we can say that a +20dB 1 kHz tone would produce 2 to 5 mV if the cartridge can track it. Because of the RIAA pre-emphasis applied to LP recordings a 0dB RIAA 20kHz tone would require a peak velocity of 45 cm/sec. If the moving coil cartridge could play this it would present 2 mV to the amplifier input. However in reality it is questionable that this will happen due to the limits discussed on the above pages. Of course, musical signals tend to be far more complex and variable than plain test sinewave tones. But the overall implication is that the output from such a moving coil cartridge would rarely – if ever – be much more than a few mV. To this we can add the point that the above values related to 0dB RIAA are the ‘peak’ values for these signals whereas sensitivities, etc, are quoted in RMS terms. Given all this it seems reasonable to question why a reviewer takes for granted that an ‘overload point’ of, say, +7dB (RIAA) at 20 kHz would be inadequate in real use. The above also hasn’t yet really taken another factor into consideration – distortion levels and the question of just how the reviewer chose the level of distortion which he felt defined the ‘overload point’. The review itself is a little vague on this matter. It lists a set of ‘overload’ values in a table results and discusses them in the text. For the moving-coil input of the 732 pre-amp it gives values for this overload as being: 31 dB at 20Hz, 27dB at 1 kHz, and a mere 7 dB at 20kHz and references these to 0·5mV RIAA input rather than the amplifier’s actual sensitivity or what was typical for real moving coil cartridges. From the above it seems clear that even 7dB RIAA should exceed what is likely from actual appropriate use. But even so, the question when I first saw these values was: how were they determined? If you seek out distortion measurements at high levels (and/or high frequencies) for various cartridges – both moving coil and moving magnet – it soon becomes clear that the distortion coming from the cartridge at such high modulation levels and frequencies would probably be well over 10% – i.e. around a hundred times bigger than the amplifier distortion taken to be the amplifier’s ‘overload point’! Now one justification reviewers, etc, often trot out in situations like this is to say that different ‘types’ of distortion sound different, and that some are more objectionable than others. There is some truth in this observation. However there would be a snag in trying to apply such an argument here. Negative feedback is often applied to amplifier stages to reduce their overall distortion, etc. This does tend to reduce the measured THD value. But it also can change the nature of the remaining distortion, risking it sounding more objectionable in some cases despite the ‘better’ measured result. Also, such an amplifier may have low distortion until it reaches ‘hard clipping’ (typically when the voltage swings of its output run up against the power voltages). However the Armstrong 732 moving coil head amplifier did not employ any overall feedback. And even at the biggest signal levels being considered here came no-where near hard clipping against its power rails. It’s distortion characteristics are similar to devices like the cartridges in being low-order, and exhibiting a distortion level which rises gradually with the signal level. Hence we have the conundrum of an amplifier which is felt to be ‘overloaded’ because it produced the order of a hundred times less distortion than a real-world cartridge would probably be feeding to it in actual normal use when playing music at the relevant signal levels. I can’t be sure, but I suspect that the reviewer simply adopted his ‘magic figure’ of 0·1% distortion as his place to plant a flag called “overload point” because he was taking for granted a practice he had adopted when examining feedback amplifiers. For these the distortion tends to stay low until the signal level is increased to reach a point where the distortion suddenly starts to rise rapidly as any further increase in signal drives the amplifier into clipping. But the head amp used in the 730 simply doesn’t behave that way. The distortion rises slowly with signal level, always being well below that of any real moving coil cartridge until you reach the maximum output they can provide. So the basis chosen for the measured “overload point” may be convenient and familiar for the reviewer, but it is simply inappropriate here. As with other comments made in the review I was left feeling that the reviewer hadn’t understood what he was dealing with in this case. Alas, the general reader with no technical background would probably not have realised any of this and been led to assume that the amplifier had a problem with its overload levels being too low. Under all this, the review gave the nominal moving coil distortion level results at reference signal levels as being less than -85dB, i.e. in agreement with my own measurements of it being 0·003% THD. The 732 certainly was significantly more expensive than the 405. But it was also considerably more powerful – particularly when asked to drive ‘difficult’ loudspeaker loads because it could deliver much higher currents into them without limiting. Given the transistors available at the time and the need for much bigger heatsinks, etc, it is at least questionable that the cost increase was “disproportionate”. The 732 also had a flatter frequency response, etc. So a proper judgement would depend on the requirements of the user. Again, the review seems to wish to pick out the moving coil stage as a justification for criticism. This issue will arise again, later, but it is perhaps making one other point here. When the Series 700 range was developed we had in the mind the approach of digital audio coming into the home. Shortly after this review Audio CD was well on the way to becoming a major source for music. The 700 units were designed with this in mind. Whereas the review seems to take for granted that for essentially all users it will be moving coil that rules. However in reality, as with the question of cost versus power, this will depend on the preferences and requirements of the individual user. Which was potentially encouraging... if you had missed the comments about tests with a “cruel” load that had apparently “...resulted in the amplifier’s demise”! The main problem for us at the time was that it took some weeks before I could recover the amplifiers and examine them. Although I asked to do so, I was also unable to meet the reviewer and – as in the case of Hugh Ford’s 621 review – try clarify just how he had reached his curious results and conclusions. Hence we were faced with a review presenting distortion/overload comments that differed from what I knew, and an amplifier that had – apparently – blown up when being tested with a loading I’d used routinely without any difficulties! As with the Hugh Ford 621 case, it seems to me that the real problem here was the failure of the reviewer to ensure we could clarify contentious issues before publication. This era was, sadly, very different to earlier decades. Although I was unable to talk to the reviewer, I recall that Alex Grant made some phone calls to either the magazine editor or the reviewer and made plain that we had serious concerns about what had been published. When I eventually got the units back I was able to test them and quickly establish that a fuse had blown but the reviewer had apparently not noticed this and – presumably – taken for granted the unit had been damaged. This was particularly puzzling because – as on many previous occasions – I was unable to get another fuse to blow by driving test waveforms into the specified “cruel” loading. I can’t be sure, but I suspect that what actually happened was that whilst driving the amplifier at high levels the reviewer actually briefly shorted the output leads. This would blow a fuse to protect the amplifier’s electronics. I can only speculate about if this was the cause, or if he didn’t notice what he had done, or decided not to say. I’d have expected him to notice because whenever I’d done that the contact points had spot-welded and stuck together! Replacing the fuse(s) always allowed the amp to show it had not suffered a “demise”, though. On one occasion I had actually tested the 732 by having it play Led Zepplin at high levels into a test load. Then repeatedly using a large screwdriver to ‘crowbar’ a contact short between it’s output binding posts. I went though a few boxes of fuses doing this. The only harm to the amplifier was that at the end of the day I had to change the binding posts because there were so many spot weld/burn marks that the spinners could not be tightened up as the thread on the posts was so damaged. But the amplifier electronics worked fine throughout. The real puzzle for me, though, is why the reviewer failed to check what had happened, replace the fuse, and simply say this in the review. If he had bothered to do so, the impression given to readers would have been significantly different. I also tried to investigate the reasons why he had got such odd results regarding the overload and distortion behaviour of the moving coil input. The difficulty here was the lack of being able to talk to him and have him explain how he had carried out the tests. However after some tests and puzzling I wrote a document that was sent to him and the magazine’s editor, challenging his results. By then it seems likely that the magazine’s editor (John Crabbe) was aware that we were very unhappy with the review, for reasons which should be clear. So he apparently asked the reviewer to write a ‘postscript’ which duly appeared in the September 1982 issue. Once again, I was not able to see what this said before it appeared, and weren’t able to have our view of what it said printed beside it. In fact, the use of pulses was only one of the methods I’d employed. Measurements with continuous sinewave tones gave similar results. Signal levels of 45 mV or more are not clipped. What I had actually said was that the overload was around +34dB referred to 0·5mV. A point to note here is that the head amplifier has a ‘flat’ response, so this would be effectively true across the audio frequency band. 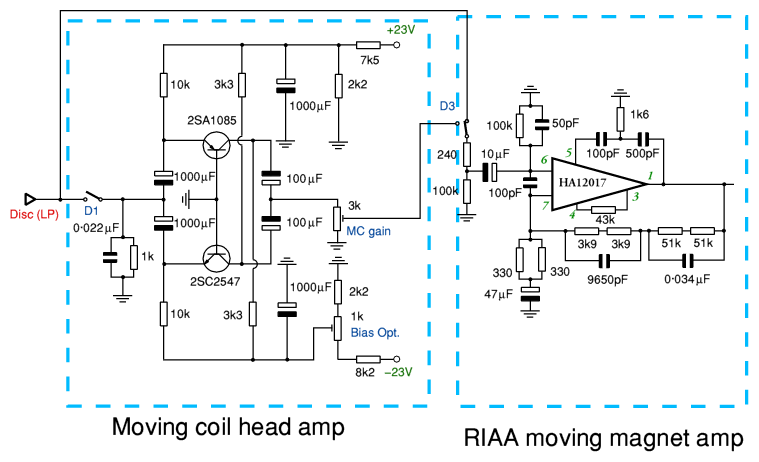 Any change with frequency would be due to the following pre-amplifier’s RIAA correction stage. So would be just as true for the moving-magnet input, which the reviewer seemed to be happy with. In the document I’d sent I had included a discussion of pulsed tests because I had wondered if the reviewer had obtained his oddly-poor overload values because he had swamped the moving coil with excessively large continuous tones. The key point to bear in mind here is that continuous tones at such grossly high levels wouldn’t ever appear from an LP and moving coil cartridge in normal use when being used as the cartridge makers intended. So using a test bench sinewave at these levels was unrealistic. The reason I’d raised this was the tendency for the head amplifier’s gain to fall when continuously overloaded. If the reviewer had simply been using the output level to assess the overload this might mean he would under-read the value he then deduced for the input level, thus causing him to increase the input still further! The comments were a warning about taking care with the measurement technique. But the postscript in the magazine didn’t seem to realise this. What I hadn’t realised – until I read the postscript in the magazine – was that he was adopting a distortion level of 0·1% as his ‘overload point’ for a moving coil input. A value which, frankly, seems absurdly inappropriate to me given the comments I have made earlier. Actually, my view – then and now – is that using 0·1% like this is was “unrealistic” for the reasons I have given again here. So the figure of 7dB as presented and used in the review seems to me to be misleading. However he doesn’t seem to actually specify any actual “higher figure”. I must confess that my jaw dropped in surprise when I first read this! I recall re-reading it to make sure I had read it correctly because I found it hard to believe that I hadn’t misread what it said. Taken at face value it is simply an example of a reviewer giving a personal ‘subjective’ assessment of the kind no-one else can dispute because they don’t use the same ears or have eaten the same things for lunch. However there was one significant fact which the comments indicated that the reviewer simply didn’t realise. One which effectively drove a coach and horses though much of what he had written! That fact was that the design of the moving coil head amp stage in the Armstrong 732 pre-amplifier was based on the design used in the Ortofon MCA-10! Again, I need to provide some technical details to explain the situation, but you can skip them if you prefer. 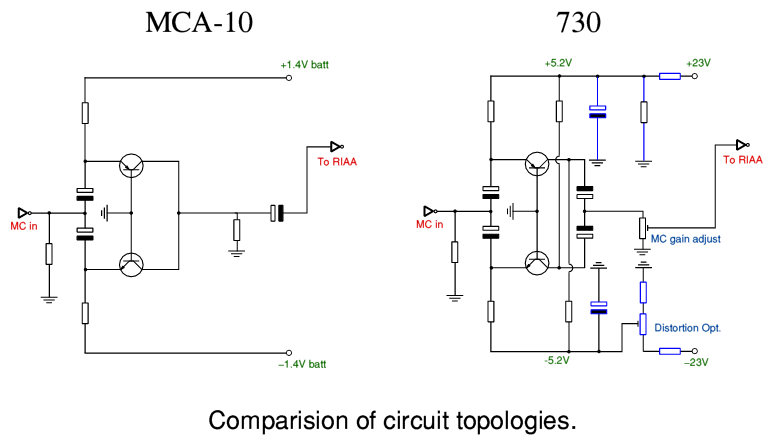 For those who have some understanding of circuit design and are interested, the situation can be appreciated by a comparison of the circuit topologies. The above shows simplified versions of the circuits used in the Ortofon MCA-10 and Armstrong 730 moving coil head amplifiers. The MCA-10 is a very neat and elegant design. It was well regarded by many and thought to give excellent results in use. Hence it is quite understandably why the Hi Fi News reviewer decided to use it as a ‘reference’ example in his ‘postscript’. The design is essentially a complimentary pair of grounded/common-base amplifier stages. This topology is an ingenious choice for small signals from sources which expect to be driving a low input impedance stage. Using a symmetric complimentary pair improves the performance because the non-linearities introduced by the individual transistors tend to cancel out, reducing the overall distortion. Hence this kind of circuit is a logical choice for most moving coil cartridges. However the MCA-10’s performance was limited by two factors. Firstly, it was powered by just two 1·4V volt (approx) cells. This gave low noise performance easily and cheaply. But a desire to conserve battery current meant the designer decided to simply connect the transistor’s collectors together – i.e. there was no external bias applied to the collectors, so their base-collector voltages were essentially zero. This can degrade performance because bipolar transistors tend to work better when there is at least a few volts difference between their base and collector. In particular it tends to reduce the signal level at which the amplifier shows signs of being overloaded by a signal. Secondly, although a pair of PNP and NPN transistors may be sold as ‘complimentary’ their actual characteristics are rarely precise mirror images of one another. As a result, their distortions don’t cancel as well as might otherwise be the case. Unfortunately, the use of small, low-voltage cells which would also be used up more quickly by increased bias current demand meant the MCA-10 design avoided active biassing of the collectors. The 730 head amp design was for use in a mains-powered pre-amplifier which has a power supply that provides ultra-low noise d.c. power rails (+/-23V). So it need not suffer from the limits imposed by using small batteries or cells. Hence in the 730 I was able to use the components shown in blue to provide ultra-low noise power rails at about +/- 5Vdc which could provide more current. That allowed me to add bias for the collectors using the added resistors. It also allowed me to include an adjustment to help correct for the lack of perfect mirror symmetry in the transistor characteristics, thus reducing the distortion levels and optimising performance. As a result the 730 head amp was basically the same design as the MCA-10, but with reduced distortion and increased overload headroom! The main review focussed on expressing concerns and doubts regarding the distortion and headroom performance of the 730’s head amp, and about the use of electrolytic capacitors in the signal path. However the same concerns could just as easily be expressed about the MCA-10. The ‘postscript’ the reviewer wrote comments on the gain compression, which again would also apply to the MCA-10. Both show the same distortion behaviours, etc. So the conundrum was why all these similarities didn’t seem to matter when the reviewer – apparently – didn’t know about these aspects being present in the MCA-10’s design, but did matter when he had seen the circuit details for the 730? To turn a familiar argument on its head: Maybe it was an example of how a ‘half blind’ test can ‘obscure’ the ability of a reviewer to tell when there was actually no real difference in the audible performance? It is perhaps worth pointing out as an aside that I was also familiar with this circuit topology from experience with RF/microwave amplifiers and an ultra-low noise preamp I designed at about the same time for use with liquid-helium cooled detectors used for measurements by professional astronomers. So I had good reasons to be impressed with its performance when dealing with very low level signals. Despite all the above, I wasn’t present when the reviewer carried out their tests so I can’t really know why he came to his curious conclusions. I can only assume that the reviewer simply didn’t know what circuit design the MCA-10 employed when he gave his ‘subjective’ comments. To him at this point it seems to have been a ‘black box’ whose performance previous experience had predisposed him to like. Yet it would behave in general in almost all the ways which he had been concerned about in the 730. For example, the MCA-10 also used large electrolytic capacitors in the signal paths. This was a shared aspect of both designs. So I can only wonder: Might he have formed a different ‘subjective’ opinion if he had known what was inside the MCA-10 and its close kinship with what was in the 730’s head-amp stage? If electrolytics in the 730 were audibly ‘bad’, why were they OK in the MCA-10? If the overload in the 730 made it sound so poor, why was the similar overload from the MCA-10 so much better? Which at least publicised the fuse failure – long after the misleading review, and glossing over the way the incident had been described in the main review as amplifier “demise”. I confess I’m not quite sure how many readers of the original review would not have decided that its wording meant “transistor failure”. The implication seemed pretty obvious, so I can now only wonder why the phrase was used and puzzle over why he apparently didn’t even bother to check, given that what he’d written also made plain that he knew the amplifier did use fuses for protection. To me, the key problem with the above Hi-Fi News review was, throughout, a failure to check results and clarify them before publication. The ‘postscript’ merely seems to do this again. Here I think both serve as a springboard for a more general set of concerns. I appreciate that reviewers need to be independent of manufacturers, and that at times a designer/maker will be wrong, and/or pushy. But my view is that this is an area where the magazine’s editor is vital in the event of any disagreement. Reviewers should check what they find with designers if there seems to be a problem before the results appear in print. And in the end it seems to me better if a review is – as in the early days of Hi Fi reviewing – accompanied by comments from the maker/designer at the time of publication. That way readers can make up their own minds on an informed basis. I can only speculate on any possible effects of reviewers also acting as ‘consultants’ to some makers and not others, out of sight of readers or even editors. Does that unduly occasionally affect some of what it said? Do some measurement errors and confusions by consultant/reviewers get cleared up before publication when the reviewer/consultant is paid by the makers? So giving those makers an unfair and hidden advantage when it comes to eventual published reviews? I have no way to know when it might. Indeed, I have no idea how much – if any! – consultancy how many reviewers provide these days. This seems to remain an area that operates out of general scrutiny. Since the review of the Series 700 was in the July 1982 issue, and the ‘postscript’ appeared in September 1982 this would have presumably “weighted” in favour of their appearance. But there was no mention of them – although the Trio amplifiers examined in parallel with them in the same review did appear in the yearbook. So if you ever encounter a copy of the yearbook, you can see a picture of the amplifiers but will get no clue as to what had occurred, or why the review doesn’t get reprinted. By this time the editor had changed from John Crabbe to John Atkinson. The only other Series 700 review I currently am aware of appeared in the September 1982. issue of Popular Hi-Fi. It was another example of a ‘comparison/group’ reviews in two senses. Firstly, the review measured and examined four different amplifier systems. The Armstrong 730/732, A&R C200/SA200, Marantz Exotic SC-6/SM-6, and Nytech CP112/CPA602. Secondly, the review specifically compared them all to the Naim 42/110. It also referred to assumed relative ‘subjective’ differences between all these and other amplifiers. The underlaying assumption seemed to one that was common at the time. In effect, to sound good, a system had to be felt, subjectively, to sound like the ‘references’. Even if we assume the subjective impressions are based on genuine differences in amplifier performance this approach exposed the conclusions to some simple forms of technical bias. Most obviously, the Naim amplifiers used a 0·22 Ohm resistor in series with their output which could alter the tonal balance of the results in a way that might ‘colour’ the impressions formed. However it was rare for reviews to comment on this or show how it was taken into account. Just as it was rare for such subjective comparisons to be based on ‘blind’ listening. So, as usual, some caution may be appropriate when reading the resulting ‘subjective’ comments. The bulk of the review was devoted to general comments or discussed the other models being considered. For those who are sceptical of the various ‘subjective’ comments the relative performances are best seen from the tables at the end of the review, so I have included a part of the tables here to consider. Given the Hi Fi News review it is no surprise that the moving coil distortion results for the Armstrong pre-amplifier show a higher distortion figure for 4 mV input than 0·5mV input. Although I should point out that my own measurements gave lower values for the distortion levels. And, as often is the case, the results here and in the Hi Fi News review differ in detail, implying differences in the measurement methods which were not explained in the reviews. Despite all that, these results make the situation clearer than the Hi Fi News review because they give the input at each frequency in terms of a specific voltage (0·5/4mV) without confusing the issue with the RIAA correction which would be applied by the following stage. Note than 4 mV relative to 0·5mV corresponds to a +18dB change. For a more realistic moving coil cartridge 0·2 mV would be more likely to be the output for a reference level from an LP, changing 4 mV into being equivalent to +26dB. Whereas, as previous examination has indicated, such levels would be unlikely to be presented from a real LP + moving coil cartridge designed for such inputs. And if they were, the distortion from the LP + cartridge would be orders of magnitude greater than the values given in the table! Although not mentioned in the reviews, the volume control was a laser-trimmed stepped attenuator with a step and tracking accuracy guaranteed by the makers (Alps). The nominal values of attenuation were printed on the fascia so the user could see and control the level with accurate repeatability. The steps were 2dB over the range from 0dB to -30db, then -33, -37, -42, -50, -60, silent. At each step the gains were correct and channel matched to better than 0·5dB. The switched attenuator scaled these down by 16dB, hence 2dB steps and 0·5dB accuracy could be obtained over a volume range from 0dB down to -46 dB. I presume the reviewers either didn’t notice this or think it worth mentioning. But in use the precise volume level tends to have an effect upon tonal quality, etc. In fact the fall below 200Hz was actually the onset of the IEC standard filter. The +4dB here is presumably a misprint because in fact the values quoted are actually more like +40dB relative to the quoted sensitivities! If, not, it is hard to know what was meant given the figures. Comments like this were common at the time, and reviewers often seemed to feel that the Naim amplifiers possessed a mysterious magic which all other makes lacked. Another comment by Chris Frankland in the same issue of the same issue of Popular Hi-Fi reporting on the USA Consumer Electronics Show (CES) probably sums up the attitude of many magazines of the period when he wrote: “And that brings us to a depressing conclusion. Fact is that with one significant exception (who said Linn/Naim?) no one at the entire CES Show could produce a good sound.” [pg 17, September 1982 Popular Hi-Fi]. Thereby dismissing every other audio item at the show in one sweeping assertion! I can well believe that many exhibits at the CES would have produced unsatisfactory sound. But the sweeping nature of the comment seems rather dismissive. We aren’t really told much about how the listening comparisons were performed. So it is hard to know what this parting shot meant in reality. It could simply be that – given the high power available – when playing so much louder, the speakers (or hearing!) was affected. I’ve never tried playing at levels of over 200 Watts into Sara or Haybrook speakers and I’d be cautious of trying it for fear of causing them some damage! Alternatively, it could mean the difference in power amp output impedances between the 732 and Naim changed the frequency response from the speakers at high levels. Lacking this kind of information, anyone using different speakers in a different room to play different music at a more sensible level might form a totally different view. From the late 1970s onwards ‘subjective comparison’ comments in reviews of hi-fi amplifiers have often fallen into a subtle trap. The Popular Hi-Fi review can be used to illustrate the problem. It stems from using the same items for two – potentially conflicting – purposes! If you aren’t interested in the technical reasons you can skip the next section, but note that it means we may have to treat the ‘subjective’ comments in such reviews with some scepticism as a guide. It is fairly common for loudspeakers to have an input impedance that varies with frequency, both in amplitude and phase. In some cases a speaker comes to be regarded as a “difficult” load because these variations are particularly large and place extra demands on the power amplifier being used to drive them This is actually one of the reasons the Armstrong 732 was designed to be able to drive high powers and currents into loads which could cause other amplifiers to clip or current limit, etc, distorting the results. Loudspeakers like the Sara and Haybrook used in this review were felt to be such “difficult” loads. For example, the Sara had an impedance that was generally low, but was as high as 15 Ohms at some frequencies whilst dropping well below 4 Ohms at others. For that reason it made sense to check amplifiers with them to see if the challenging load caused them to struggle. However when a review also used the same speakers with a Naim amplifier of the time as their “reference system” for listening tests this can lead to a conflict which reviewers seemed either not to know about, or could be bothered to explain and explicitly take into account! One obvious aspect of this can be illuminated fairly simply as follows: The “reference” speaker plus amplifier combination (Naim plus Sara or Haybrook in this case) has been chosen because those units were felt to work well together as a system. The snag being that this can occur because a particular departure from perfection in one of the items was being ‘corrected’ by an opposing departure in the other. The root of the problem here was that the Naim amplifiers of the period tended to have series resistors in their output. This then interacted with the impedance variations with frequency (and sometimes signal level) of the speakers, subtly altering the frequency response. If the speakers had been designed to sound at their best by a designer who happened to be using an amplifier and leads that also had a similar resistance then the two items would be like a key and lock. You would get the best results because of this impedance interaction. Most good quality power amplifiers – including the Armstrong 732 – had a low output impedance, well below 0·22 Ohms. So would produce a subtly changed response from the speakers which were optimum for an amplifier with 0·22 Ohms output resistors. The speaker would now not deliver the same sound. Such changes can slightly affect the frequency response, timing/phase response, and distortion. That key would not fit that lock. Note that the implicit standard requirement for a power amplifier is that it acts as ‘voltage source’. i.e. it should in general have an output impedance as near zero as practical, and loudspeakers are also assumed to operate on that basis. Choosing as a reference system a loudspeaker which is a ‘difficult’ load that happens to sound at its best with an amp whose unusual output impedance helps optimise the results and gives a result the reviewers are already pre-disposed to judge ‘good’. Then using the same speaker to listen to an amplifier with a conventional output impedance to see if it sounds ‘the same’. In practice, this tilts the playing field before you start, All else being perfect (including the amplifier you are reviewing) it tends to yield the result that the amplifier ‘sounds different’ – and almost certainly will be judged ‘not as good’ before any other factor comes into play. The dice were loaded. Given this risk, would it not be fairer to do comparisons in a way the avoids this risk? Most obviously, by splitting the two loudspeaker roles. i.e. Use a ‘difficult’ loudspeaker to check if that amplifier fails, or current limits, etc. Then – if you must use a ‘reference’ amp with unusually high output impedance as your ‘reference’ – use for listening comparisons a different speaker whose behaviour is not affected by the resulting impedance interactions. Armstrong had a history of supplying useful accessories with their units. For example, the 600 units came with a DIN-phono adaptor and a small screwdriver to adjust the tuning presets. I have often wondered after the 700 reviews if we should have supplied a small accessory bag for reviewers. This would have contained two 0·22 Ohm resistors and labelled, “Optional Magic Sound Quality Adaptors”. Only 40 pairs of the 730/732 amplifiers were ever made. No magazine adverts appeared because they would have cost too much. The Series 700 did appeared at one audio show, and would have been seen by some potential customers there. But for many people their only awareness was from seeing the above reviews. Given what they printed it isn’t a surprise that the Series 700 didn’t sell like hot cakes! We did repeatedly question what had been in the Hi Fi News review, but little of that appeared in print. Instead the ‘postscript’ by the reviewer was, at best, ambiguous and really didn’t clarify the situation. The only other outcome was that I did write an article for Hi Fi News which appeared a few months later. But by then Alex and Barrie had decided they had gone as far as we could. So, after 50 years, Armstrong abandoned manufacturing entirely. I focussed on working on other areas beyond hi-fi . It is interesting to speculate, now, what would have happened if Armstrong had not lost its factory before 1982. Given an operating factory it is likely that 600 range units would have continued to be made and sold alongside 700 units. This would have provided a cashflow to carry things forward, pay for adverts, and keep going. Giving a chance for people to actually hear the 700 for themselves, and for other reviews and comments to appear that gave a better impression. Maybe we would then have changed the moving coil preamp simply to make the units more ‘reviewable’ (see below), although that may well have swiftly become irrelevant as Audio CD was adopted and many potential users ceased to be narrowly focussed on moving coil cartridges. The main reason for Armstrong ceasing to continue as a manufacturer was the loss of the factory and the general difficulty at the time of raising sufficient capital to invest in setting up a new one. That loss occurred long before the Series 700 reviews. And given the tide of hi fi from Japan the company may well have ceased trading after a few more years anyway. We can only speculate now about might-have-beens. Alex Grant and Barrie Hope put in a lot of effort, but lacked the resources to go on following the unhelpful reviews. I had continued to work on the Series 700 after leaving the factory for various reasons. In part this was because I wanted to see what was possible and how good a pre/power amplifier we could develop. I wanted amplifiers that music and hi-fi enthusiasts could enjoy using. It was also because I had become infected by the ‘family’ atmosphere Armstrong had. I wanted it to succeed because I wanted Armstrong to survive and the work done by the company’s people be appreciated by those who bought the results. And I wanted what we’d made exported, not to have the jobs exported. Decades later, we can look back and simply treat it as a lesson from history to reflect upon. But it was fun whilst it lasted. I still enjoy the results I get using Armstrong equipment. And from the emails, etc, I get I know so do many others. Just seems a shame that so few ever had the chance to listen and decide for themselves and the products didn’t survive after the way they were treated by the reviewers. I wonder how many other good designs went the same way. James Moir was an outstanding engineer who wrote many items for the UK audio magazines of an earlier era. He was reported as saying that by the late 1970s we had reached a period where equipment not only needed to work well, it also had to be “reviewable”. This meant it had to fare well in terms of the fads, fancies, demands, and personal opinions of the reviewers of the period. I feel I’ve effectively outlined some of these above. For me, though, the basic problem is when there is a failure to check odd results before publication, and the lack of willingness of the magazines to allow manufacturers or designers to have their own responses printed alongside the review. These things were routine in the 1950s and 1960s, but they now seem to have gone the way of hen’s teeth. Yet are reviewers/editors now infallible? Oh, and I still have and use two 730/732 combinations in daily use. I also give these a test routine every now and then. They continue to work fine after 30 years. This includes the dreaded electrolytic capacitors! And I’ve used them with various ‘generations’ of Quad ESLs even if they might classify as “difficult” loads. No fuses have been harmed in the process. That said, I recall a conversation I had with Peter Walker of QUAD at an audio show when I told him I was using my 700s with ESL-63’s. He pointed out that the speakers had triac ‘crowbars’ that might drop a short across the terminals if I used a 200W plus amp and over-drove the speakers. I pointed out that he’d only used 5 Amp triacs, so in fact if that ever happened the 730 would fry the triacs! We then agreed that I was safe enough as I knew full well that I had to keep the levels within reason because I wanted to keep my speakers safe. After decades of use amps and speakers are still fine, and the combination sounds great. Although I now use ESL-2805s. I also know the general advice is to replace electrolytic capacitors after a decade or more. But experience has shown me that well made and chosen examples can survive and continue to deliver fine sound. I only know the whereabouts of one other 730/732 combination. I do wonder where the other 37 went. If you have one I’d be interested in hearing from you.